Facebook Graph Search can’t go unnoted; it is a game changer. What’s new? Graph search unlike web search (which is based on keyword search), is trying to understand how people, places and things relate to one another rather than match words to any text. In other words, we can search for people, places, pictures or interests that are on Facebook (...what’s not on Facebook) with specific criteria (intersect people, places and things). For example: “friends who have been to Paris”, “people who like things I like”, “Indian restaurants in New York liked by friends from India”. Super cool, right? Why is it so powerful? 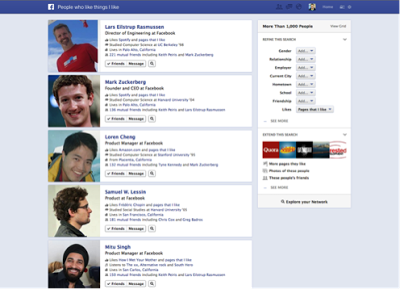 because Facebook transforms into a discovery engine. With over 1 billion users that’s a lot of information right there, we can actually make use of all this data, it is mind blowing. Think of all the possibilities, look up restaurants by locals or chefs recommendations, fun places to visit by friends or family, movies by experts, meet new people by interest, workplace, location, etc. (huge for professional networking and dating). I don't use Facebook quite often. But it was cool to read this post for me. Good job.